Remember the march of the elephants across jungles in JungleBook? In reality, Asian elephants are now frequently seen crossing highways and railroads, thus posing a grave threat to an already shrunken population. We can barely imagine a country without properly connected roads. They are the links that have undoubtedly become an integral part of human civilization and of course, the bedrock of the modern developing world. Since prehistoric times, roads and trails have played a significant role, not just connecting people from different corners of the world but also fostering trade and economic growth. With the world witnessing an exponential growth in human population, the rate of development of basic infrastructures too is expediting. For instance, India, being among the fastest growing economies, has almost 5.5 million km (in length) of road networks in total, connecting the major cities and villages (as on 2015) and stands in the second position in the world, after the USA. These burgeoning networks are inevitable for developing countries to catch-up with the rest of the world. However, this exerts a huge environmental cost, leading to nearly one-sixth of total carbon emission in the world. The transportation sector stands as one of the major contributors to changing the global climate regime. Just like humans, animals too use their own ‘roads’ for their regular movement from one foraging or mating ground to another, within and between the forests. In forests with densely packed undergrowth, animals would need a well-connected trail or path to facilitate their locomotion. Well, this raises the question- who then, designs, constructs and develops a ‘road’ or path in a forest? The answer is unequivocal! The animal kingdom has its own ecosystem engineers to build its paths- the elephants! Bestowed with magnificent body statures, elephants are capable of moulding and modifying the entire landscape- thus promoting the migration and movement of various animals including big cats, small carnivores and other herbivores. Several anecdotes demonstrate that the elephant-constructed paths are used by indigenous folks or tribes for their daily chores and even for building the ‘human roads’. The elephant-made ‘roads’ too have their intertwined networks. Quite like humans, elephants also have their own ‘national highways’ which connect different habitats and are called ‘corridors’.These corridors are frequently used by the traffic of elephants to move from one forage-rich habitat to another. The ‘state or village highways’ are designed digitately to connect different water-holes, pockets of forests and salt licks. Why do elephants cross the roads? One of the major negative interactions between humans and elephants originates from the human-made highways crisscrossing the elephant highways. These roads are important to both the species for their respective quests. Several national highways in India traverse through different National Parks and elephant habitats. The fatal consequences of constructing these metal roads by cutting forests are not limited to just elephants; they are distorting the food-web by smearing lower-taxa on the roads to sending ruptured bones of carnivores flying into the air. What makes this issue even more serious, however, is the involvement of elephants. High cognitive capabilities, strong social bonds and long-term memories do not just add to elephants’ uniqueness, but also make them more vulnerable to harm by human activities. When viewed from an elephant’s eye, they have been using the same routes or corridors for centuries, with no other alternatives to reach other forests or habitats either to forage, to find water or to congregate and meet their conspecifics. On their way, they attempt to cross man-made roads and this is not only risky but can also turn fatal. If the road crossings are mistimed, then they could potentially collide with speeding vehicles, resulting in injuries or even death. Hence, such demises or road-killings can leave an irreversible imprint on their minds, causing traumatic stress, which could be harmful to both elephants and humans. How do elephants cross the roads? The national highway NH 67 and NH 181 bisects one of India’s biggest National Parks, Bandipur and continues to the adjoining Mudumalai National Park. Hence, while travelling through this highway, sighting herds of wild elephants waiting to cross the road is very common. Even though the width of the road is 8-10ft, the raging traffic quite often causes a halt to the free movement of elephants. On a normal weekday, about 3500-5000 vehicles use this highway. Whereas during vacations and festive seasons, this number could rise to as many as 10 thousand vehicles! Facing these many vehicles amidst the wilderness, for animals such as elephants that live in a peaceful society, is something vexatious to experience. The size of the vehicles and the way people in the vehicles behave seem to have a direct impact on the behavioural responses the elephants exhibit. Some of the vehicles carrying goods or people pass by the forests on a daily basis, however, they seem to create less anxiety amongst the herds waiting to cross the highways, as these vehicles do not stop on the road or halt in front of the elephants. 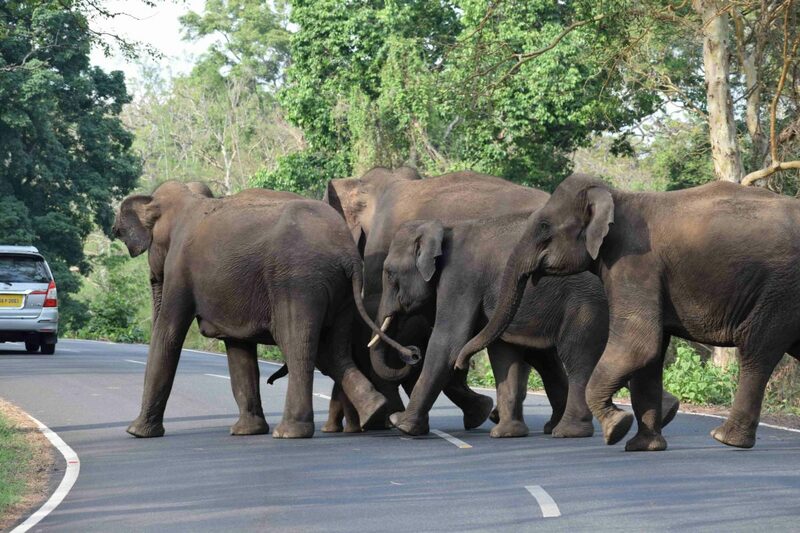 Elephants crossing roads, nevertheless, get disturbed. They seem to show more aggressive behaviour, mock or full-fledged charge, towards two-wheelers than towards four-wheelers. Though the exact reason behind such response is not known, it is assumed that having highly sensitive olfactory and auditory systems, they might perceive the engine sound of two-wheelers, as resembling one of their own calls or might perceive the presence of humans on the two-wheelers as a threat. If not provoked or disturbed, elephants generally have a calm temperament and avoid disturbances. The usual responses of elephants towards the motorists are becoming alert and agitated, both characterized by the lifting of the tail, spreading of the ears, and raising of the head and most often retreat. 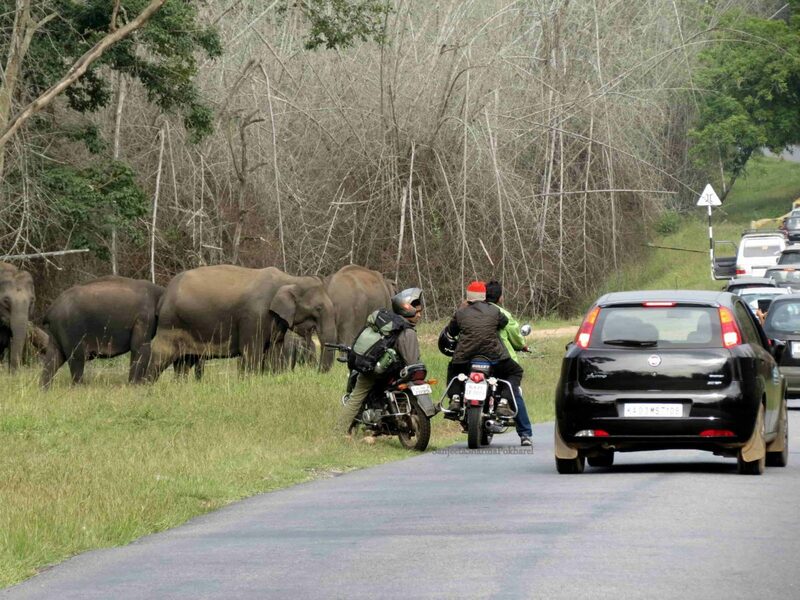 The mock or full-fledged charge is generally rare unless the motorists are too close to elephants and cause repeated agitations. Furthermore, it could be highly precarious if the herds attempting to cross man-made roads are associated with newborn calves or injured individuals. Recent research has documented that elephants usually wait for about 20 minutes on an average to cross a road. Having deep-rooted social bonds, adult females usually lead and initiate the crossing as they are more experienced. Sometimes, they wait and remain vigilant on the road, allowing others to cross and taking the risk of guarding their herd members against upcoming vehicles or other disturbances. Juveniles or young ones, on the other hand, show a high degree of anxiety by running across the road and are more susceptible to injuries and further distress. Apart from poaching and habitat destruction, roads and railways have now become new threats that contribute to the elephants’ mortality. Recent reports suggest that in the last five years, as many as 100 elephants have lost their lives either on the road or due to collisions on railway tracks, making them one of the top two large mammals killed in India due to man-made reasons. This demands a prompt and pragmatic action, rather than theoretical, to bring down such threats and to protect elephants. The altered behavioural responses of elephants and increased incidences of road-killings and collisions should be an alarm for policies makers. This certainly does not mean the avoidance of constructing roads, but perhaps designing roads which would minimize threats to animals and contribute to the economy. Political will and nexus among stakeholders and eminent experts could certainly bring about a change in the way the roads are being constructed. Many countries have made attempts to build safe passages for wildlife to cross busy roads. One such successful attempt is the Mount Kenya Underpass constructed for elephants, to avoid the road traffic in Kenya. Similar models could be applied in India as well. However, this might incur further environmental costs, as currently, elephants are already highly disturbed and constructing underpasses or overpasses could further aggravate them further. Hence, the idea of safe ways for elephants should be considered in some strategic locations only. Whatever the case may be, we can’t completely deny the disturbance caused to elephants by the traffic and roads, however, we can certainly prevent negative interactions and make elephants feel safer. * Parking our vehicles at least one hundred meters away from elephants and allowing them to cross first. This will reduce the anxiety and agitation in elephants making them feel safer and less stressed while crossing the roads. * Turning off engines and lights and remaining quiet, giving no room for elephants to get aggressive or disturbed. * Driving within the permitted speed limit as suggested by the forest authorities. It’s even better if we drive slower than the suggested speed limit avoiding unwanted halts in between the forests. This would save many other lives along with elephants. * Not just elephants, but no other animals should be teased or provoked for the sake of fun and entertainment. Teasing elephants only invite danger to ourselves and to our loved ones. * Everyone loves to possess an exotic shot of wild animals. But stopping a herd or an animal from crossing the road, flashing lights and capturing photographs would not make us heroic., Allowing them to safely cross the road, on the other hand, will! * Littering should be completely stopped along the roads as this could potentially kill elephants and other animals in a chronic way. Our aim should be to reduce negative interactions with elephants and to facilitate their fear-free movement. Blaming each other or the authorities only results in creating ripples in society and certainly is not helping these gentle giants. As a passerby, showing respect and basic etiquette towards the road-crossing elephants would not only reduce fatalities but would also satisfy us as a responsible onlooker. Now it’s upon us to decide whether to honk and shout at elephants or to let them move peacefully on roads most travelled by. Nachiketha Sharma is a PhD student at Wildlife Research Center of Kyoto University (PWS), Japan working in collaboration with Center for Ecological Sciences, Indian Institute of Science. His work mainly focuses on understanding the vocal communication in Asian elephants. He is basically interested in simplifying the complexity of science for common audience to aid in the conservation of elephants. Authorities & general public must understand that it is their habitat we are intruding upon not visa versa , hence it is we who should be more considerate & responsible towards them in our own interest & wellbeing. Hope good sense will prevail before it is too late. It is our ownmoral duty to preserve & protect our environmental ecology which we owe to our future generations to come.